The four days bag packing was a wonderful success and the Super Value management and customers were very happy. The Christmas atmosphere was electric and we thoroughly enjoyed our task. We raised a total of €10,739. We are extremely grateful to the Super Value management, our packers and not least the generous shoppers. We are booked for Christmas 2006 and are looking forward to it. The atmosphere was wonderful and everybody enjoyed themselves. The day started at 9.00a.m when the collectors started their bucket collections at all the shops and shopping centres in Carrick-on-Suir and Clonmel. Collectors also collected in all the villages in which the ponies and traps passed through. The Pony and Trap drivers were busy preparing their ponies and traps for the long drive. The Pony and Trap Drive gathered at the Fox’s Den, Kilmacow. The team included, Billy Meany with his pony – Bugsy, John Kearns with his pony – BoBo, Tommy Foskin with his pony – Monkey, Tony Flynn with his pony – Black and guest driver, John Fogarty with his pony – Misty. They left Kilmacow at 11.45a.m and arrived in Clonmel at approx 4.30p.m. There was a break of one hour at The Blarney Woollen Mills, Ballydine, Carrick-on-Suir to give the ponies a rest. Mary Corcoran, Ballinerla, Kilmacow dressed up as an old woman and accompanied Billy Meany in his trap to Clonmel. The day finished with a most enjoyable cabaret at The Fox’s Den. DVD’s and Videos which capture the fun and atmosphere of the day are available at €15 each. To order a copy please phone Geraldine at 087 7747710. Sincere thanks to all Marfan Syndrome Research supporters who helped in any way including collectors, sponsors and contributors. James McGrath, Dungooley, Carrigeen, County Kilkenny, died on 25th July 2005. James is John, Bill and Michael McGrath’s father. The family requested that donations be given to The Marfans Research Foundation in lieu of flowers. 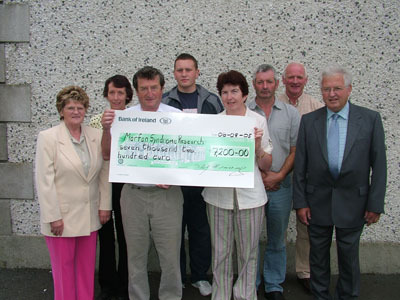 The total donated amounted to €800. We are very grateful for this generous response. The atmosphere on the day was electric and the camaraderie amongst all the LADIES! was remarkable. Imelda, Nora and Geraldine were generously supported and sponsored by their friends, family and Marfan Research Committee. Sr Philomena Purcell came 132nd out of 898 and has the medal to prove it. The total raised was €661.75. Well done Philomena and a BIG THANKS TO YOU AND ALL YOUR GENEROUS SPONSORS. Kevin trained for four months for the event. Well done to Kevin and many thanks for the donation.